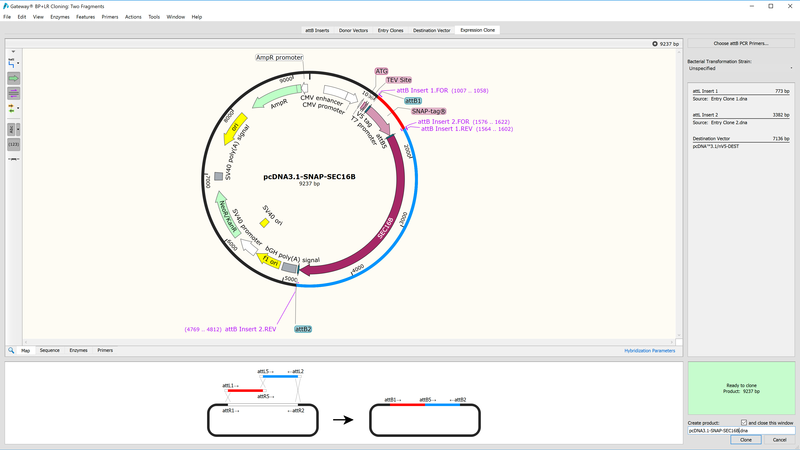 SnapGene provides elegant, information-rich windows for simulating a variety of common cloning and PCR methods. Confirm that a restriction site is suitable for cloning. 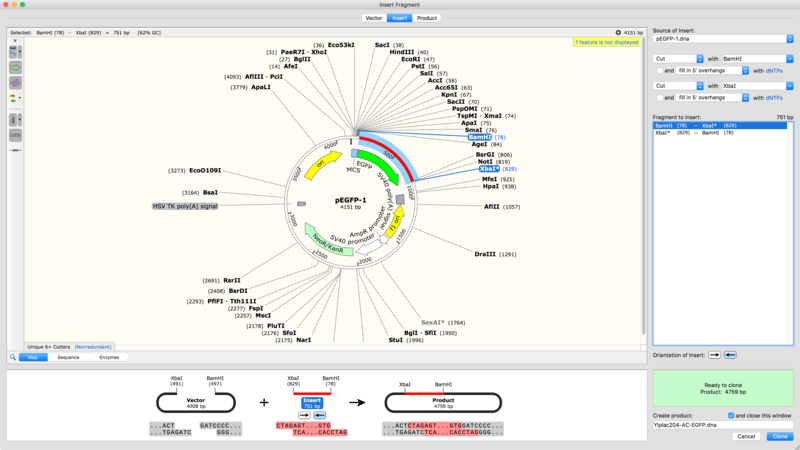 Highlight unique restriction sites in bold font, or choose the automatically defined Unique Cutters or Unique 6+ Cutters enzyme set. Visualize all aspects of the cloning process. If you already have a procedure in mind, the simulation will take only a few seconds. If a cloning procedure has a design flaw, the error can be caught and corrected. 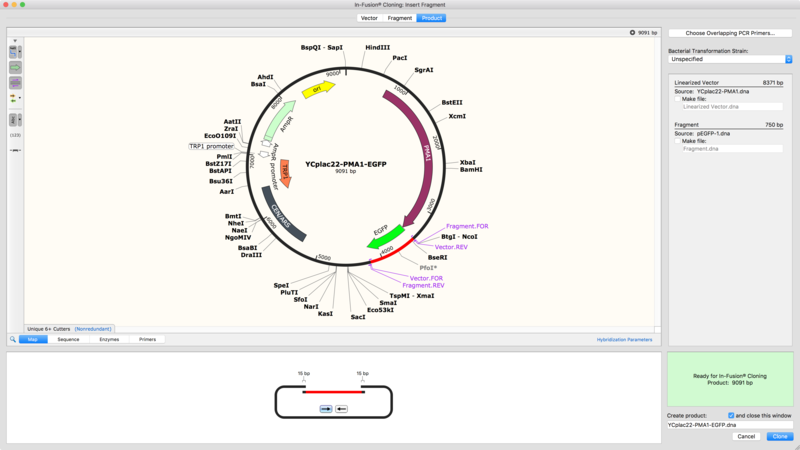 Use your own primers, or ask SnapGene to design primers automatically. The product file stores the template and primers in its history. Fuse fragments by overlap extension PCR. Assemble up to eight fragments. 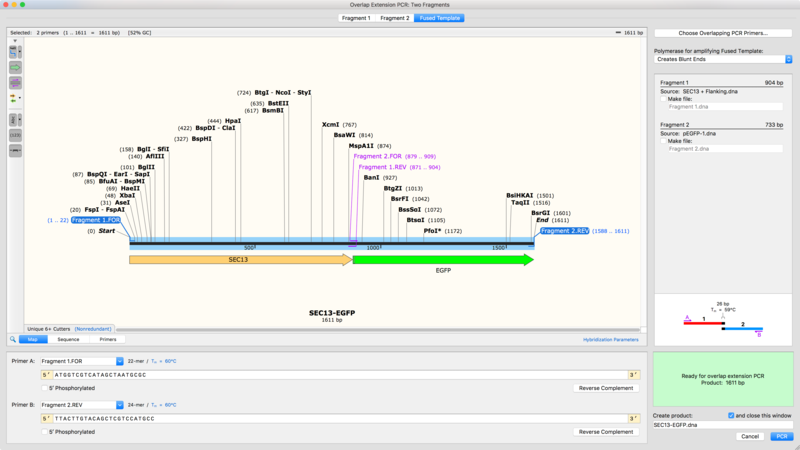 Select the fragments to be joined and their orientations, and SnapGene will design primers. Perform site-directed mutagenesis using mutagenic primers. 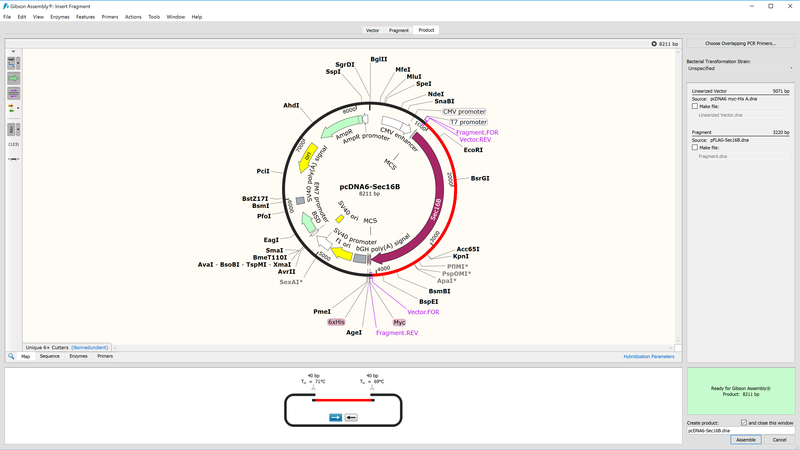 Select a mutagenic primer, and press a button to see the modified plasmid. History colors highlight the mutation. 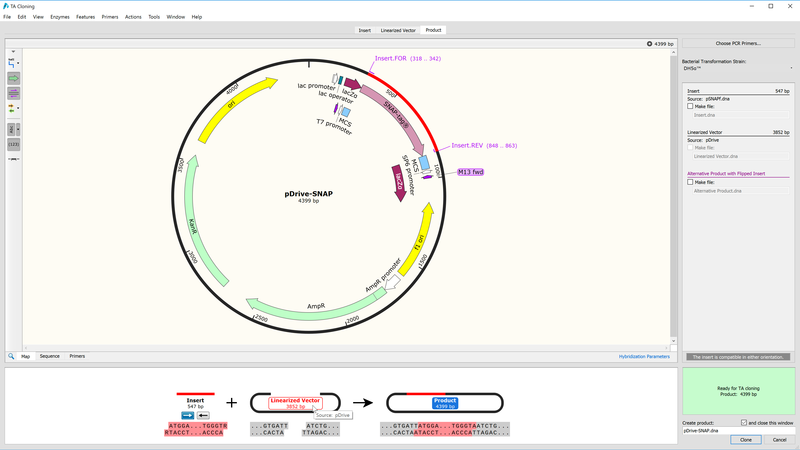 Simulate Gateway® BP cloning or LR cloning, or both at the same time. For convenience, common Donor Vectors and Destination Vectors are provided. 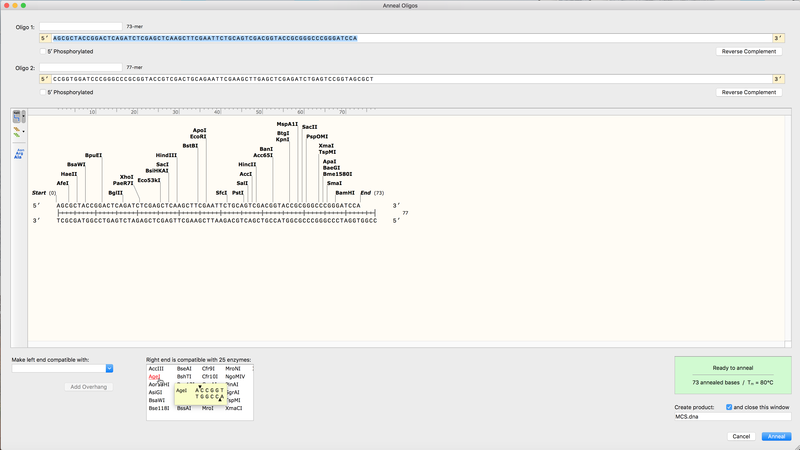 Select the fragments to assemble, and SnapGene will design primers. Simulate Gibson Assembly by fusing up to eight fragments, or by inserting up to eight fragments into a vector. Gibson Assembly is a popular method for seamless cloning. 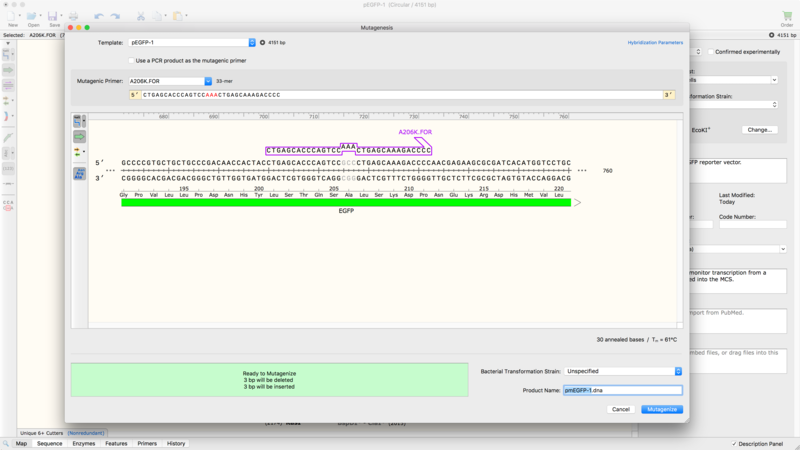 Select the fragments to be fused and their orientations, and SnapGene will design primers. The linearized vector can be generated by enzyme digestion or inverse PCR. 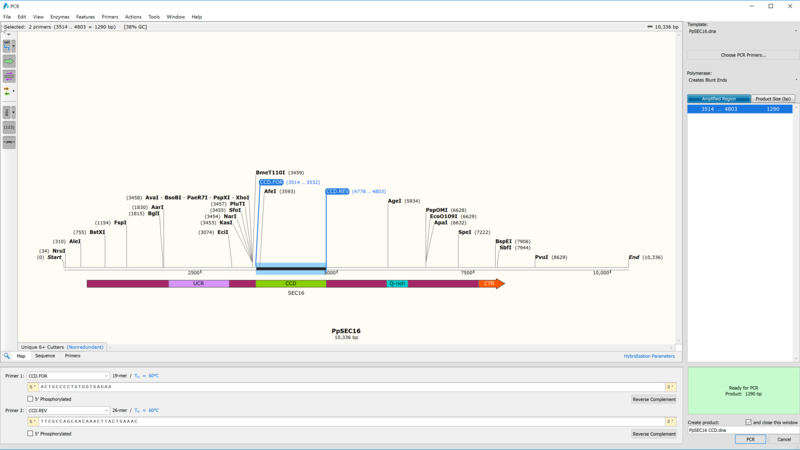 Simulate Clontech’s In-Fusion cloning by inserting up to eight fragments into a vector. In-Fusion cloning is a remarkably versatile method for creating seamless gene fusions. Capture a PCR product by TA or GC cloning. Choose conventional TA cloning or high efficiency GC cloning. For convenience, common TA cloning vectors and Lucigen’s GC cloning vectors are provided. Anneal two oligos to form a double-stranded product. Use simple controls to add overhangs for restriction cloning.